this drawing go es back to my sports theme. Golf is HUGE in central oregon. Many consider us the palm springs of the north. That seems kinda dumb...but anyway, I had to address it. I love this golfer because he was modelled after my father-in-law. Tony had a pair of pants that he always played in. They were the greatest combo of plaid, yellow, and lime green!! Almost every golfer I draw wears pants like that! Then, to really reflect my abilities at golf, I added the two guys in the background. They are about as good at this as I am. In fact, that one guy is using a pool cue! 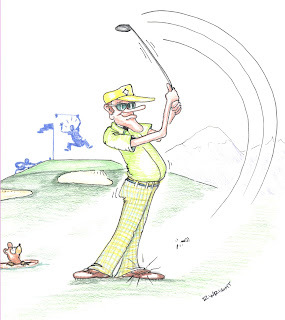 I am not a golfer! OK, I see Tony now. I always thought is was Bob Hope. Oh and remember you're a better golfer than me.